Nederburg is a fast and secure theme. This Hugo theme was ported from competethemes. For more information read the official setup guide of Hugo or use Appernetic. After installing the Nederburg theme successfully, we recommend you to take a look at the exampleSite directory. You will find a working Hugo site configured with the Nederburg theme that you can use as a starting point for your site. 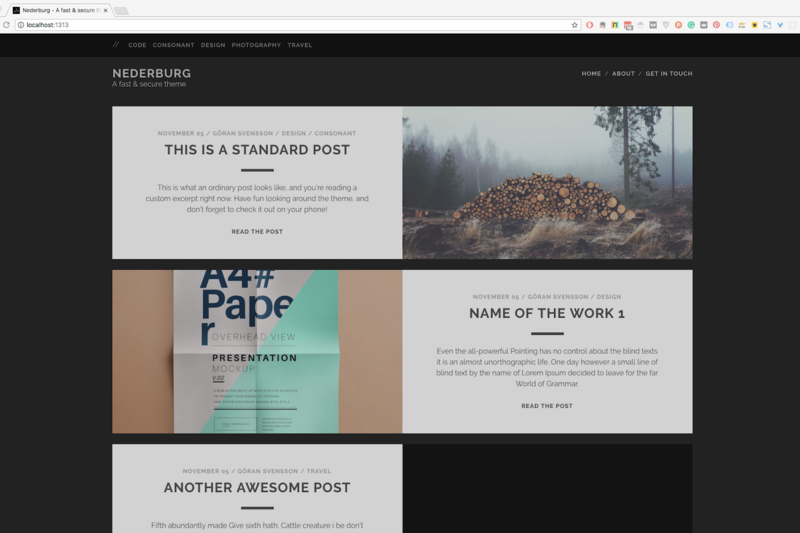 Nederburg uses the minified production version of the style sheet from the wordpress version. Create css/custom.css in your <<base dir>>/static folder and add all your custom styling. The optional comments system is powered by Disqus. If you want to enable comments, create an account in Disqus and write down your shortname in the config file. You can disable the comments system by leaving the disqusShortname empty. You can optionally enable Google Analytics. Type your tracking code in the ``. Leave the googleAnalytics key empty to disable it. "Göran is an avid blogger and the founder of <a href='https://appernetic.io/'>Appernetic.io</a>. This is the author bio shown after posts." facebook      = "full Göran profile url in facebook"
googleplus    = "full profile url in googleplus"
twitter       = "full profile url in twitter"
linkedin      = "full profile url in linkedin"
stackoverflow = "full profile url in stackoverflow"
instagram     = "full profile url in instagram"
github        = "full profile url in github"
pinterest     = "full profile url in pinterest"
Now you must have an author in the config for the author bio section to be visible. If you have a writer and set it in the markdown file it will override the author in the config. See the exampleSite folder for a working solution. Default is to use the static folder for images. If you want to have images in the post folder you unmark the seetings in the config file. Add the possibility for a description for each category. Add pagination to the front page. Add dropdown menu option to the left sub menu. Add previous next pagination in blog post. Check that Disqus don’t break anything. This port is released under the MIT License. Thanks to Steve Francia for creating Hugo and the awesome community around the project. And also thanks to competethemes for creating this awesome theme. List of all the great people and organisations that help us fund this open source work.